OPUS: Rocket of Whispers (OPUS: Rocket) is the spiritual successor to OPUS: The Day We Found Earth. 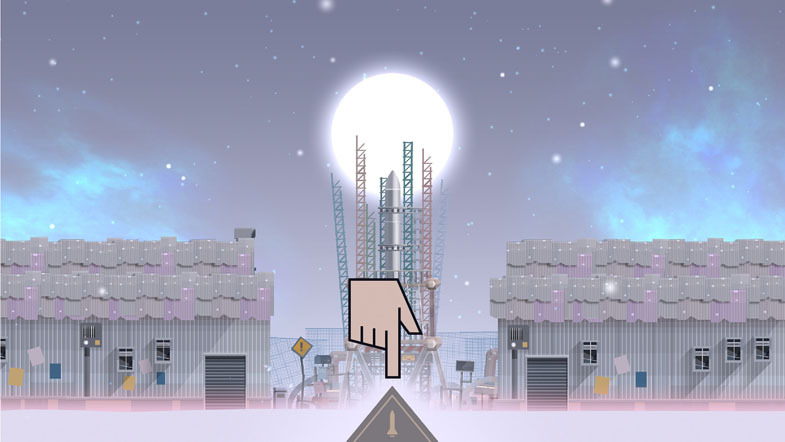 Hoping to repeat the success of the original OPUS, SIGONO (the developer) with the help of Coconut Island Games, has published OPUS: Rocket in the same vein. The result is another story-heavy, quirky adventure that dwells on loneliness and motivation. I haven’t played the original OPUS, so I cannot comment on how well this sequel follows for someone who has. I’ll be discussing OPUS: Rocket as if it were a stand-alone game, so consider yourself advised to read elsewhere if the continuity with the original is important to you. OPUS: Rocket pleasantly surprised me, although it took me a while to warm up to it. It has heart and beauty that doesn’t really show at first, particularly during the introduction — which is when it should be making a good first impression. OPUS: Rocket is like that shy, artsy student at the back of the class who presents to strangers as awkward, but among friends is straightforward, empathetic, and even cool. Not everyone can befriend such a person. You will have to enjoy art and possess patience to find a friend in this case. Most titles with a post-apocalyptic plot have gameplay that focuses on personal survival or saving the world, neither of which is the case here. 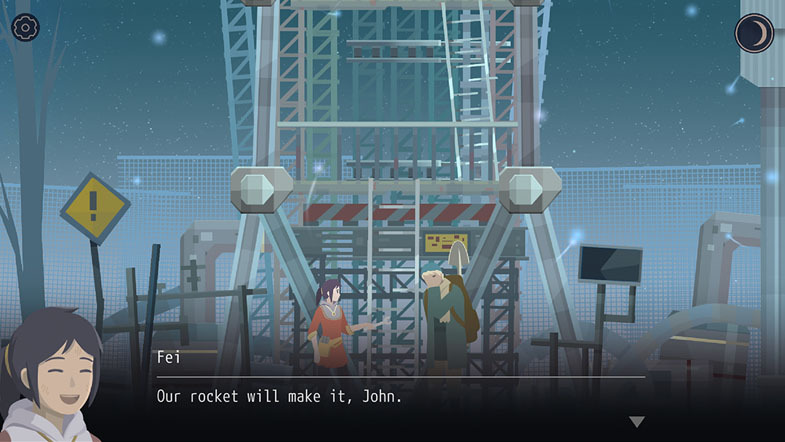 You play as John, who meets Fei (a spiritual guide and rocket-builder who has woken from cryogenic sleep) many years after the plague has wiped everyone else out. You agree to help her launch a rocket to send ghosts who died from the plague to their rightful “burial” in the stars — in no small part because the ghosts are haunting you. Basically what this means is… you’re her gofer. Fei needs materials and you fetch them for her. You will discover additional quests along the way, but those will also entail a lot of wandering around, finding things. 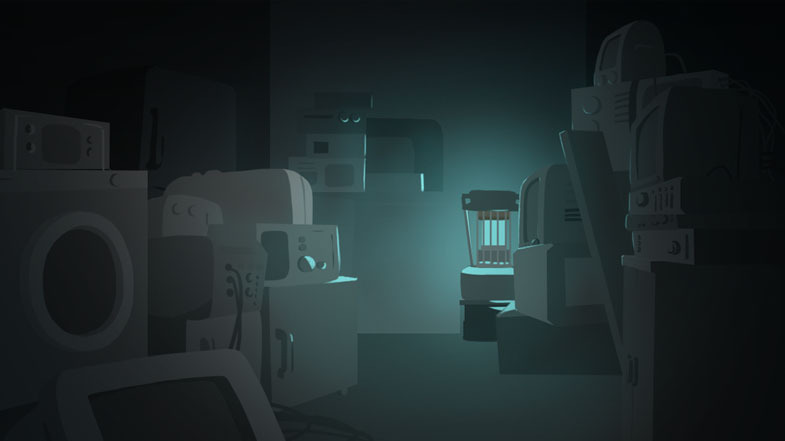 Occasionally, there will be a cutscene, a crudely-animated scene (these are pretty disappointing and come off amateurish), or an image, but most of the time you’ll be walking around looking for stuff. This is why the story is so vital to OPUS: Rocket: without the emotional impact that follows finding the things you’re looking for, you wouldn’t care enough to do it. That so much rides on the storytelling makes it hard not to notice the times there are problems with it. It’s mostly successful; but when it isn’t it involves unnecessary repetition, too much exposition, and unbelievable dialogue. The first time you’re able to control your character, for example, the dialogue is highly repetitive — patronizing, even. You literally have only one path you can possibly walk down and glowing orbs also light the way to guide you, yet still the text prompts you several times to walk in the only direction you can go. Most players will be annoyed by these instances of extreme hand-holding. That example also works to illustrate another problem OPUS: Rocket has: It isn’t balanced correctly in difficulty. It starts off way too easy (like with the hand-holding), then turns too difficult by the end. You’re often prompted early on to accept clues that you may not want or need, or they’re just handed to you. By the time you’ve got the hang of things, though, everything gets harder and you are deprived of hints. If you're struggling at that point, you might abruptly feel like it got too difficult. The worst thing about OPUS: Rocket is the bizarre choice to make John, the protagonist, angry and rather unlikeable. In what is probably an attempt to create angst and possibly humor, John’s interactions with Fei are often hostile, where he yells at her and calls her a “witch” (which she is, but still) in way that comes off like an insult or an expletive. It can be jarring, and creates an unfortunate obstacle in the way of trying to relate to him. John also makes the most illogical, bizarre statements from time to time, destroying the feeling that it’s a real conversation. He yells at Fei in frustration, “Why isn’t the rocket ready?” even though he knows perfectly well why. This could be forgiven once or twice, since he is being driven bonkers by the ghosts that are haunting him and is eager to get rid of them. But it’s not infrequent; he’s constantly asking this useless question when he already knows the answer. But the illogic doesn't stop there — no, no: Later on, to himself, he asks “What’s [Fei’s] problem… why so single-minded about space burials?” Things like that are enough to make you laugh out loud, although, sadly, that isn't the intention. In addition to being angry and sometimes saying illogical things, John is also rather stupid. He keeps asking Fei why the ghosts are coming to him (since they’re only supposed to be visible to witches) and she offers explanations, but then he just continues to ask. It becomes clear pretty soon to the player what’s going on, but… he evidently doesn’t catch on. There is also a scene — which is probably intend to be funny, but fails — where he accuses Fei of lying about being a witch because she’s not wearing the “fancy” clothes he used to see witches wear. Does he really believe a witch loses her spiritual power without the clothes, or that she can’t abide to wear anything else if she's truly a witch? For heaven’s sake, they’re in a post-apocalypse environment (in heavy snow, I might add), and he is conjecturing that it is somehow evidence she’s not a witch because she’s not dressed up all fancy. As my final evidence (actual evidence, as opposed to what he would call evidence) of his stupidity, I will leave you with his statement that “a loose screw caused the rocket to disintegrate in mid-air”. He thinks it fell out of the rocket and that’s what explains the crash. Bad writing and other problems aside, the roughly five or six hours it takes to complete OPUS: Rocket will be rewarding in many ways. Yes, it’s slow-paced, but that intentionally makes you wonder about certain things, giving you time to feel suspense before the answers are provided. And aside from the crudely-animated scenes I mentioned before, the graphics are stimulating, evocative, and satisfying. I encountered only two trivial bugs during gameplay and understood immediately why they happened. So, despite my rather lengthy explanations of what was wrong, there was a lot that was right. Overall, OPUS: Rocket felt competent, heartfelt, and unique. This slow-paced, emotionally-impactful adventure that is effectively a treasure hunt is suited to gamers who would enjoy being along for the ride in the healing process after a traumatic event. Sentimentality and patience are advised, as you won’t find any exploding helicopters here; merely a quirky, imperfect meandering through the struggles that go along with loneliness that will be largely successful in making you feel satisfyingly sad. Proud Editor-in-Chief here at OPNoobs, Tiffany is ready and willing to help sentences in need. (Sometimes all she can do is make them comfortable before they're deleted.) Her hobbies include trying to survive in Don't Starve: Together and designing 3D houses in Blender to upload to the virtual world of Second Life. Originally from Canada, Tiffany says "about" strangely sometimes (but it sounds nothing like "aboot") and she's enjoying her transition from snow to rain in Seattle. She graduated with an Honours Bachelor of Arts from the University of Toronto, majoring in English and minoring in Philosophy and Writing & Rhetoric. She believes thinking helps writing and vice versa.